OAT sneakers: eco-friendly sneaks you bury after you are done! OAT shoes have a line of sneakers. 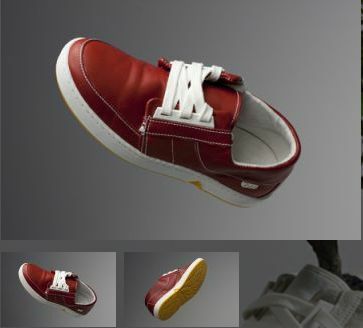 According to Springwise newsletter, this biodegradable shoe company recently brought out a new ‘Limited Skin Collection’ — a series of sneakers made from colorful leathers developed by Royal Hulshof Tanneries. The leathers are completely biodegradable and are made using non-toxic tanning agents. OAT concept is simple: When it’s time to throw away the OAT Shoe, the wearer simply buries it instead. The shoe is fully biodegradable, and, as such, could be used to help other plants grow. Keen to realize their vision of a fully biodegradable shoe whilst incorporating a stylish design, the team at OAT Shoes were forced to develop and source many of their own materials and processes. OAT Shoes founder Christiaan Maats says, “It makes sense to make products that are part of the planet we party on. We all like the nice bits in fashion, so why not make those bits fully biodegradable?”. It made sense to the judges at the Green Fashion Awards too, where OAT Shoes walked away with a prize. I personally liked the idea and the styles. They have tons of various sneaker styles at their site – www.oatshoes.com – red, green, blue sneakers… brown styles seem to be sold out! Let me know what you think!